NB : This fact sheet supplements and clarifies fact sheet A17 "Various ecological effluent treatment solutions"
The bar screen is the first stage in most effluent treatment systems. It is a tank provided with a mesh screen that is used to remove large solid waste that cannot be eliminated by the system or which may clog the system. Scoop systems are devices designed to feed water intermittently to sand filters or vertical constructed wetlands. Bar screens are installed in watertight containers (made of concrete in these pictures), covered by a hatch or a removable mesh screen. 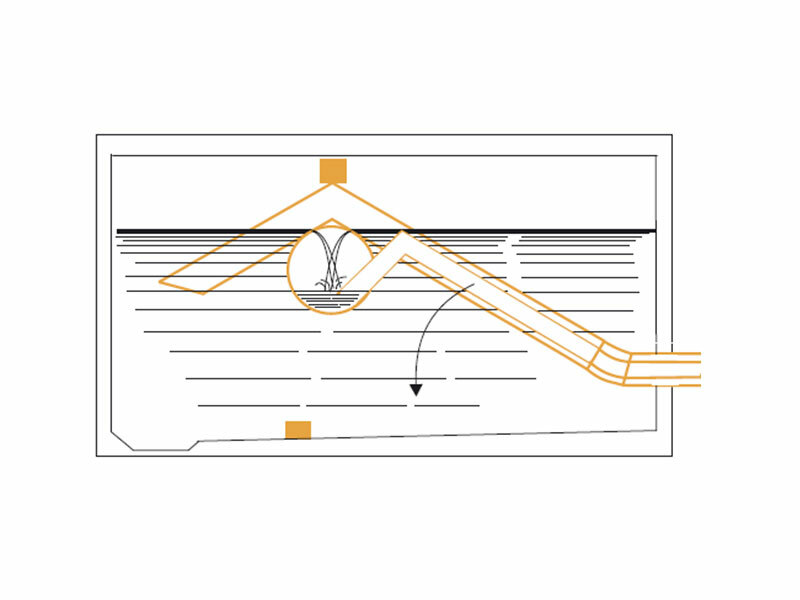 The water inlet and outlet are separated by a mesh screen which stops the largest waste. 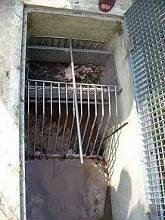 A rake adapted to the mesh screen and a draining basket must also be provided. These items should preferably be made of stainless steel. Waste that accumulates must be regularly removed from the water using the rake and stored in the tank. The mesh screen is inclined to make it easier to recover the waste. The draining basket must be emptied regularly as it may cause bad smells and attract rodents. The space between two bars of the mesh screen should be smaller than the diameter of all the pipes which are used after the bar screen in the treatment system, to prevent the system clogging. In general, the space is about 2 cm. 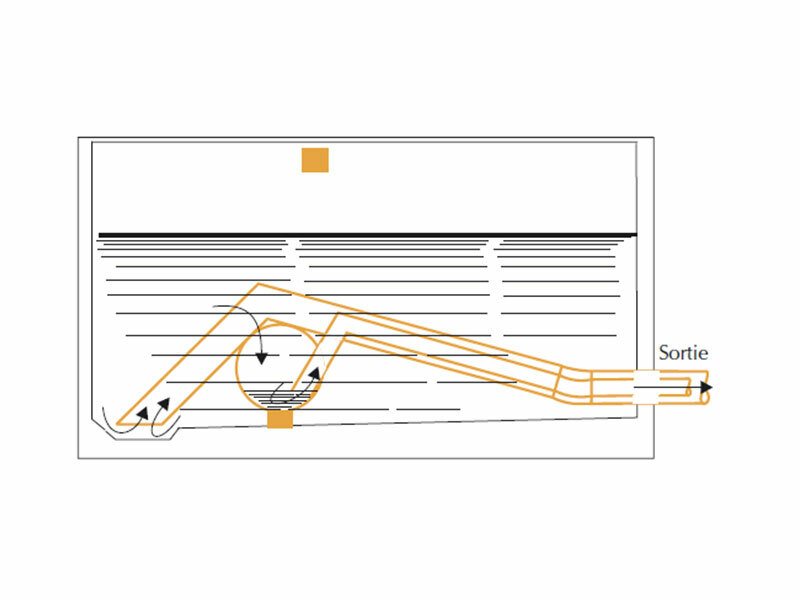 For systems handling large flows, two bar screens are sometimes installed in series, the first one with a greater bar spacing than the second one : for example, 40mm for the first one and 20mm for the second one. 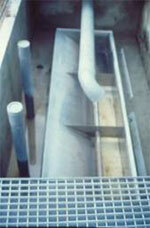 Scoop systems are used to convert a continuous flow of water into an intermittent flow of water. The operating cycle of such a system is simple : first, it accumulates water without letting it through then, once its storage capacity is reached, all the water is released at once. The accumulation then begins again. These systems are used in sanitation plants to intermittently feed sand filters or vertical constructed wetlands. Two scoop systems are presented here : the tipping trough and the self-priming flush. and is then completely emptied before returning to its initial position. It is especially suitable for small systems. During the filling phase, the centre of mass is to the right of the pivot pin (see diagram), and the trough rests on the right stop. An additional weight on the right of the trough may be necessary to make sure that the trough is in this position when it is empty. On account of the trough’s shape, the centre of mass moves to the left as the trough is filled, until the whole trough tips over. The trough then rests on the left stop for the time it takes to be emptied. When fitting the trough, the position of the stops has to be adjusted and weight may need to be added in the trough to ensure that it is completely emptied at each cycle. 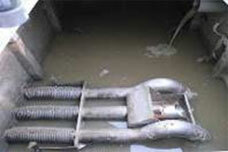 The self-priming siphon can be used in large sanitation systems. It is installed in a pool where water collects. The siphon pipes are flexible at the end connected to the bottom of the pool and are attached to a float at the other end. The float rises gradually as the water accumulates. When it reaches the top stop, it fills with water and begins to flow, carrying with it the pipes which fill with water and empty the pool, forming a siphon. Once the pool is emptied, the float rests on the lower stop and is emptied in turn by an additional siphon. 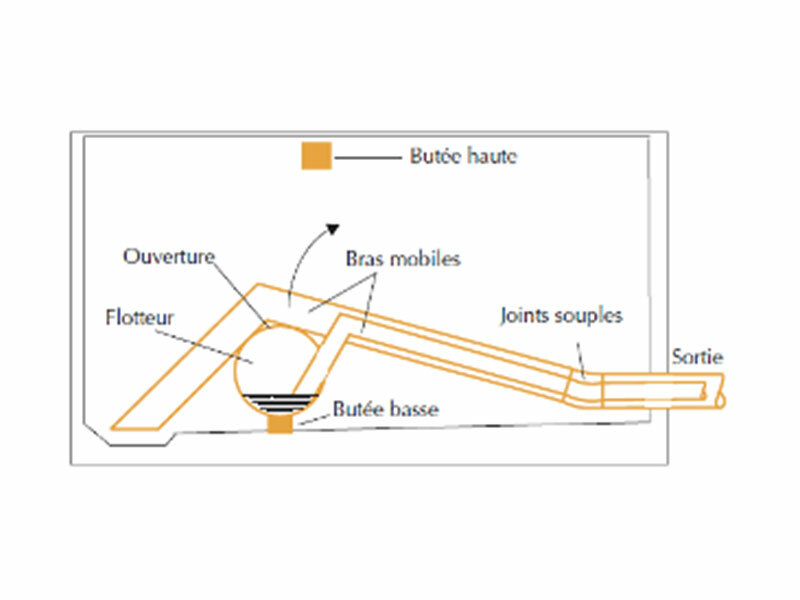 This type of siphon (SINT patent, Joudes siphon) is more reliable than the tipping trough. Another advantage is that it is easy to adjust the scoop volume : the position of the top stop just has to be changed. Other systems, more complex to use, are sold by specialised companies : valve flushing systems, solenoid valves and lift-pump stations (the latter two require an electrical power supply). - Scoop systems : see pages 19 to 23. 3) PDM and PSEau SMC Methodological guide (concerted municipal strategies) : "Choosing suitable technical solutions for liquid waste disposal", which is a very interesting and informative 136-page illustrated guide produced by GRET, pages 116 to 127 deal with the problem of intensive treatment of septic drainage sludge and sewage..